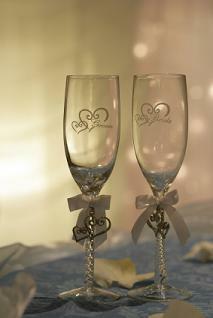 Decorated Champagne flutes add a special touch to any occasion. 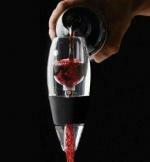 Most wine connoisseurs consider the Champagne flute the only way to go when it comes to enjoying a glass of the bubbly. The glasses are specifically designed to concentrate the nose of the Champagne and deliver it to the perfect spot on the palate. The shape of the flutes also allows the carbonation (the bubbles that give Champagne its nickname) to last longer. They're easy to find and range from the very expensive to the very inexpensive, so there is no reason why a set of Champagne flutes shouldn't be added to everyone's barware collection. Metal decorations - These Champagne flutes have metal adornments, usually pewter, on the stem or on the bowl of the flute. Hand painted - Every type of design imaginable. You can also find places in which you can design your own personalized Champagne flutes. Engraved - The most traditional and sophisticated decoration for Champagne flutes. Printed Champagne flutes - Get your company logo, the bride and groom's names or anything you want printed on Champagne flutes to toast your next special occasion. Here are a few websites to browse for your next set of specially designed Champagne flutes. If you aren't ready to buy any glasses quite yet because you can't decide on the perfect design, the following websites will give a few great ideas as to the type of glasses and designs available. Things Remembered - This website offers crystal engraved flutes, metal flutes, flutes with sterling silver bases and a whole lot more. Buy Promo Items - This site is perfect for that next retirement party or corporate event because they offer printed Champagne glasses at very reasonable prices. Royal Selangor - These out of the ordinary flutes are just a little more on the expensive side but the glassware is elegant and beautifully decorated. Swarovski - The stems of these flutes are adorned with stunning Swarovski crystals. Hand wash the glasses - These glasses must never go inside a dishwasher. Over time, dishwashers tend to etch and ruin the glasses. Moreover, the high temperature of the water will ruin hand painted designs. Never use a scouring pad - There should be no reason to use one anyway, but, if that's the only thing available for washing out your Champagne flute, opt to gently rinse them out with warm water instead. Champagne and Champagne flutes remind everyone of celebrations. Whether it's a wedding, an anniversary or a job promotion, toasting the occasion with a delicate clink of these tall and slender glasses is tradition. Decorated Champagne flutes make a celebration even more special. Specially designed Champagne flutes are a great way to commemorate a special occasion and provide a keepsake memento of the event. Whether it's a bachelorette party, wedding, anniversary, graduation or retirement party, these flutes are a perfect way to toast the guests of honor.